I just came back from a 10-day-trip home to Japan. :) I travelled from Dublin, via Frankfurt, to Tokyo - on Lufthansa economy class.. where I ordered gluten-free in-flight meals! The flights cost €790 for a round trip: I checked the price with Google during the specific time period, and this was the cheapest on the day - it was the busy season! It could've been cheaper if I would have stayed in Tokyo until September. 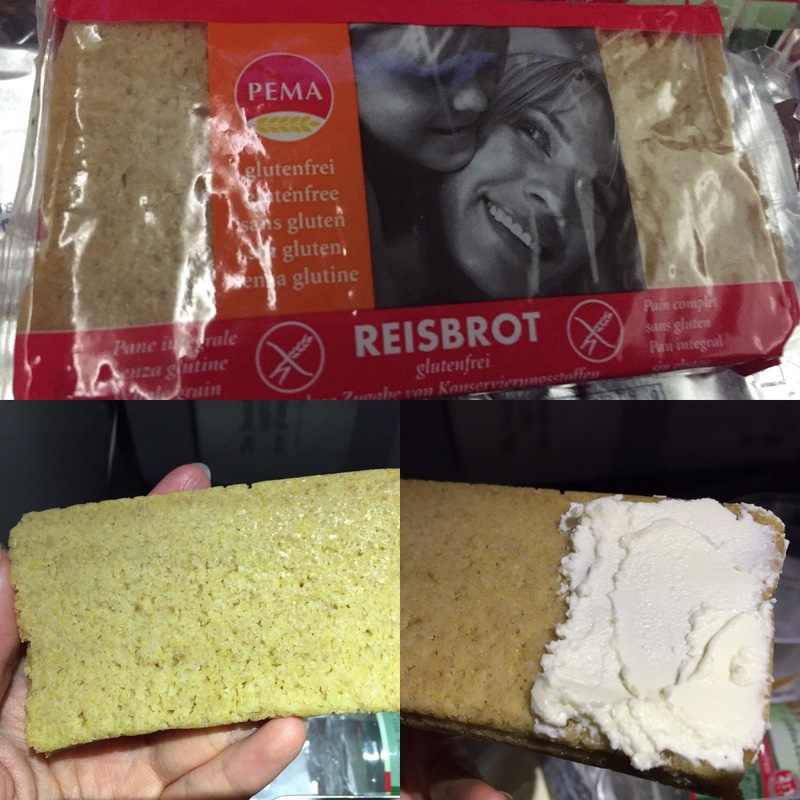 So, here it goes my review of the gluten-free in-flight meal I had during my Frankfurt-Tokyo flight (LH716) on 18/08/2016. 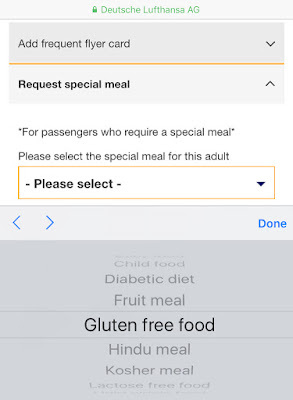 According to your dietary requirement, you can choose from the following: Diabetic diet・Fruit meal・Hindu meal・Kosher meal・Moselum meal・Gluten free food・Lactose free food・Light whole food・Low cholesterol food・Low sodium food・Meal without fish・Reduction food・Vegetarian meal・Vegan meal・Baby/kids food. During the first 2 hour flight from Dublin to Frankfurt, they served us a sandwich and you could choose from either turkey or cheese. It was quite a surprise as I didn't expect that they would serve food for such a short journey (I am more used to Ryanair, you know!). But mind you, those weren't gluten free. Then, during the 12-hour flight between Frankfurt and Tokyo, they served us both dinner and breakfast with a snack* at the beginning. * In the Lufthansa flight, the snack has always been a little packet of pretzels -which contains wheat - so you have to either refuse it when offered or give it to someone who can eat gluten. The gluten-free meal (dinner), was served a couple of hours after the departure. It was lovely how this flight attendant offered it to me with a big smile, and checked that I had ordered a special meal. :) It arrived around 10-15 minutes earlier than other passengers meals... for me, this made me feel kind of awkward...as no one in my area had been served any food then. So, I waited until the people around me were served to begin. :D I guess this may be necessary, to make sure they don't have any mix up's though - luckily, it actually stayed very warm because I kept the lid on. :) For the record, my meal said gluten free on the lid of the main dish as well as having a little sticker saying GFML - and it also had my seat number on the container for the appetiser. Main dish was called, Hähnchenbrust Kräutersauce (chicken in herb sauce). It tasted slightly like curry with coriander, but the flavour was very subtle - it went well with all the other dishes though..! The early bird gets the worm...oops! Later...they served breakfast before landing, which I missed as I was still asleep.. :( Well, it was really my fault that I woke up just when the attendants were putting dishes away! So my review has to end here..my apologies! I guess it will be a good surprise for those of you who may be taking a Lufthansa flight soon, but my opinion is very high since the dinner was very satisfying - my only advice is to stay awake at least 3 hours before landing! Anyhow, it was a great surprise since I've heard that the in-flight gluten free meal can be...you know what I mean..:D I even prepared myself some fruits and snacks as I expected lots of rice cakes and less filling food. Here is my review of the flight meal on my return flight! Hope you have a lovely day..!